iOS is an operating system with many possibilities, allowing to create from really simple to super-advanced applications. There are times where applications have to be multi-featured, providing elegant solutions that exceed the limits of the common places, and lead to a superb user experience. Also, there are numerous technologies one could exploit, and in this tutorial we are going to focus on one of them, which is no other than the Text to Speech. Text-to-speech (TTS) is not something new in iOS 8. Since iOS 7 dealing with TTS has been really easy, as the code required to make an app speak is straightforward and easy to be handled. To make things more precise, iOS 7 introduced a new class named AVSpeechSynthesizer, and as you understand from its prefix it’s part of the powerful AVFoundation framework. 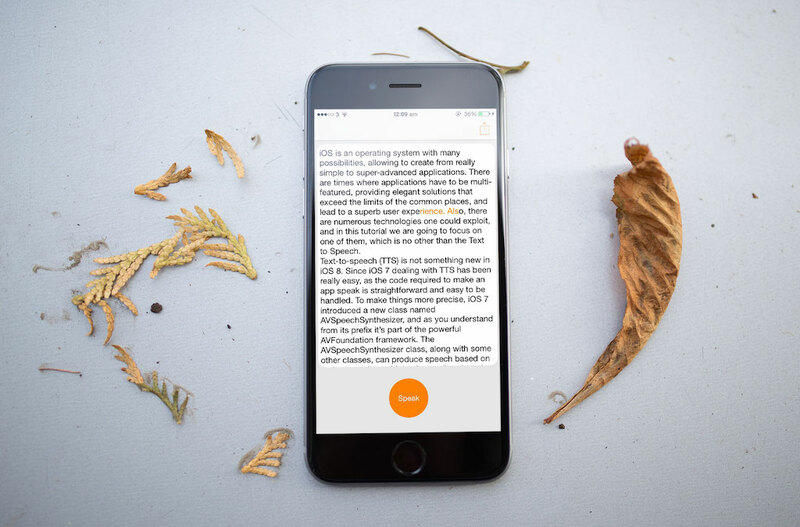 TheAVSpeechSynthesizer class, along with some other classes, can produce speech based on a given text (or multiple pieces of text), and provides the possibility to configure various properties regarding it.